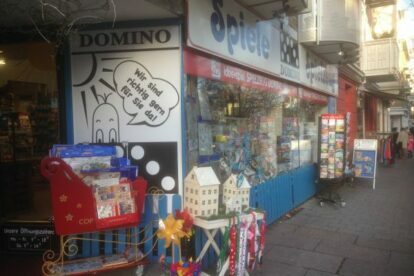 Every time I desperately need some doodads like a small amount of putty that glows in the dark or a refreshing present like some magic cards for a birthday I am sure to get it here, one of these small old toy stores packed with toys up to the roof where you feel the love for children and child-like humans. The owners make sure to have very kind staff and the children from the neighbourhood come here to find out what to get as a birthday present. I recently went and was offered a very nice packaging for my small item (a mussel with algae that you let “grow” in a water basket!) and they did it with love. I totally like going through the small baskets with random things like whistles and chewing gum or tongue tattoos and offer my friends or myself a little treat. Of course they have big things like Playmobil and Lego, too. One thing’s for sure: you’ll leave with a smile no matter how you entered the place.